A couple of years ago, I was trying to find out how many rural students qualified for the Common Entrance Test (an admission test to enter Medical and Engineering colleges in Karnataka) and secured ranks within the first 1000. I was not surprised to know that only 6 rural students qualified to join medical colleges and 44 of them for engineering within the first 1000 ranks. Does this mean that our rural students are basically not capable of competing with their urban counterparts? Or does this trend reflect a deeper malaise? The issue is quite complex and needs some reflection. One needs to appreciate that children in rural areas are taught by teachers who are not adequately qualified to prepare them for this kind of competition. These children are handicapped by the fact that their schools lack qualified teachers who can teach them English, Science and Maths. These three subjects are the basic requirements if they have to do well in today’s competitive environment and prepare themselves for higher professional education. Most children who complete their high schools in rural areas have studied under resource-constrained circumstances. Very few schools have labs; and if they have labs, they lack the consumables to do the experiments. And if they have both of these, then they do not have qualified science teachers. The Government is now trying to remedy the situation by recruiting science teachers, who by themselves have become a scarce commodity. Mushrooming BPOs and call centers mean that very few people take to pure sciences in their higher education and even if they did, they prefer to join the high-paying jobs at these centers. All this leaves our rural children at a tremendous disadvantage. Ensuring that our rural children get exposed to science and maths meant looking at practical and doable interventions. We at SVYM decided to focus on training the teachers, promoting the use of labs wherever available and initiating two novel ventures. 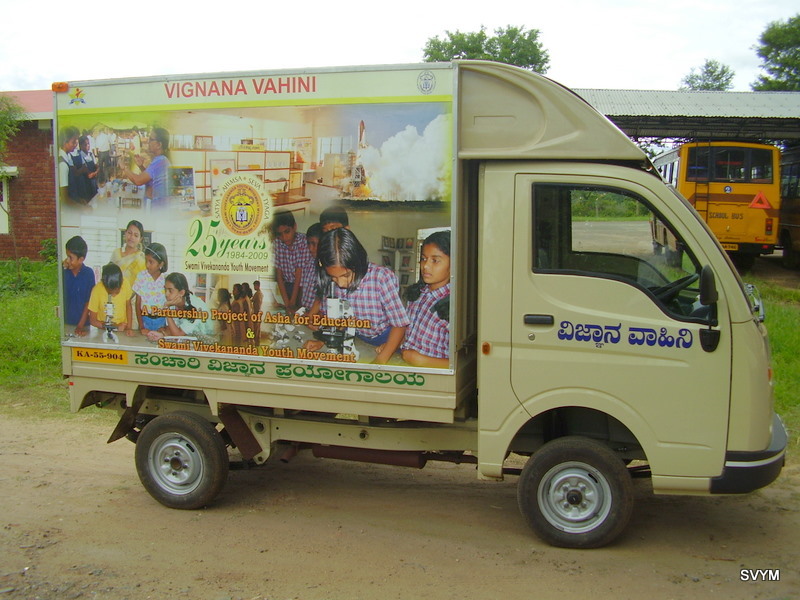 One was to start a mobile science lab that would visit the Government schools in H.D.Kote Taluk and allow children to get a hands-on feel of the experiments. The experiments would be based on the curriculum of the 8th, 9th and 10th classes. The other idea was to put up a Science Exploratorium at Saragur that would be open to all children from the nearby areas. This science park would be overseen by the team of science teachers at our Viveka School of Excellence and help stimulate an interest in science for children. The inputs for the Exploratorium would be from friends, engineers, science educators and professionals from all over the world. Many are from the IIT-Chennai, who over the last 2-3 years are in continuous touch with us in giving a definite shape to our ideas. We hope that a few years from now, we will be able to change the way ‘science’ is learnt in rural Karnataka. Come and join us in this ‘Science Revolution’ by contributing ideas, giving us your time and money to make it all happen. As Swami Vivekananda was fond of saying: Give our people a scientific temperament, and the rest will follow.